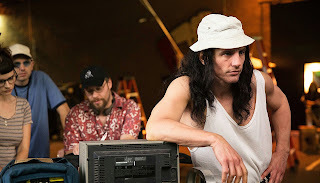 In what should be a nerdy, behind-the-scenes reconstruction of the making of an appallingly bad movie, The Disaster Artist constructs a very watchable, entertaining portrait of the ‘artist’ Tommy Wiseau who had unexpected success with the cult film The Room. Taking just $1,800 from the box office at its opening weekend, the movie which is estimated to have cost $6m to make – funded from Wiseau’s unexplained deep pockets – has developed a cult following that celebrates its awfulness with midnight screenings attended by costumed fans who shout out key lines and throw things around the cinema. The Prince of Wales Cinema in London screens The Room several times a month to a full house. Expect more questions than answers! 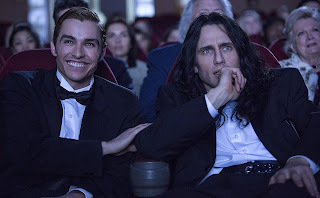 The Disaster Artist begins with the origin story of the unusual partnership between cocky Tommy Wiseau and shy Greg Sestero who met in an acting class in San Francisco. Headstrong Tommy suggested that they should follow their dreams, and Greg packed his bags and headed to live in Tommy’s apartment in Los Angeles. The wannabe actors struggle to get work until they take matters into their own hands. Tommy writes a script for The Room, casts himself as the lead, Greg as the second lead, and sets about producing and directing his masterpiece. ‘Car crash’ doesn’t begin to describe the bedlam on set. While definitely a novice at directing, Tommy’s acting is also frustratingly poor, but given his lack of inhibitions, we watch with increasingly despair to see if he will ever hit rock bottom and begin to doubt his abilities. The pair’s pinky promise to “never give up on our dreams” carries them through. As we know, reaction to The Room is bittersweet: the film is a critical failure but a slow-burning popular success. But you don’t need to be at all familiar with The Room to be entertained by The Disaster Artist. In fact the only disappointment with the film is that you will come out of the screening wanting to immediately go in and watch the original movie. Bad news: I don’t think The Room being shown in Belfast any time soon, the screening at the QFT on Saturday evening is sold out and it’s not available on any streaming service, so you’ll have to make do with a DVD or some YouTube clips of the ‘best’ worse scenes. James Franco plays Tommy and also directs the film. Speech and language therapists attending a screening of The Disaster Artist will be distracted by Tommy’s very peculiar speech pattern and syntax, and his accent while possibly due to a car accident may also be a clue to his uncertain background. James Franco captures every conundrum at the heart of the central character and plays alongside his younger brother Dave Franco who dyes his hair to step into the role of Greg. The seriousness with which Tommy directs take after take on The Room’s set is contrasted with the uncontrollable mirth at the film’s premiere that follows the audience’s initial loathing. The end credits show how faithfully the makers of The Disaster Artist have recreated some of the original film’s scenes with nearly interchangeable actor, costumes, intonation of dialogue, props and sets. The egotist and his babyfaced friend are an unusual and somewhat co-dependent pair: Tommy is nothing without his younger crutch to encourage him; Greg is nothing without the opportunities (somewhere to live and something to act in) that Tommy provides. Tommy can’t catch a ball thrown to him, but his total lack of self-awareness means that he’ll not avoid the situation. A lot of the female characters are quickly discarded along the way. Megan Mullally quickly impresses as Greg’s Mum but doesn’t escape San Francisco. Amber Brie has an intermittent supporting role as Greg’s girlfriend Amber until her frustrations cause her to move out of town. Script supervisor Sandy (Seth Rogen) brings a lot of levity to what could have spiralled into an exasperating hour of on-set nonsense with his bemused reactions to the madness that he’s being paid to support. Going into the cinema preview frankly expecting to be underwhelmed by a reconstruction of a movie I hadn’t seen, I walked out having been taken on a journey of annoyance, bemusement and finally satisfying glee at this off the wall real life story of friendship, passion and ignorance. The Disaster Artist is released on Wednesday 6 December and is well worth a watch over the festive season. Check listings for Movie House, QFT, Odeon, Odyssey and Omniplex - the screening dates are quite varied over December and January.